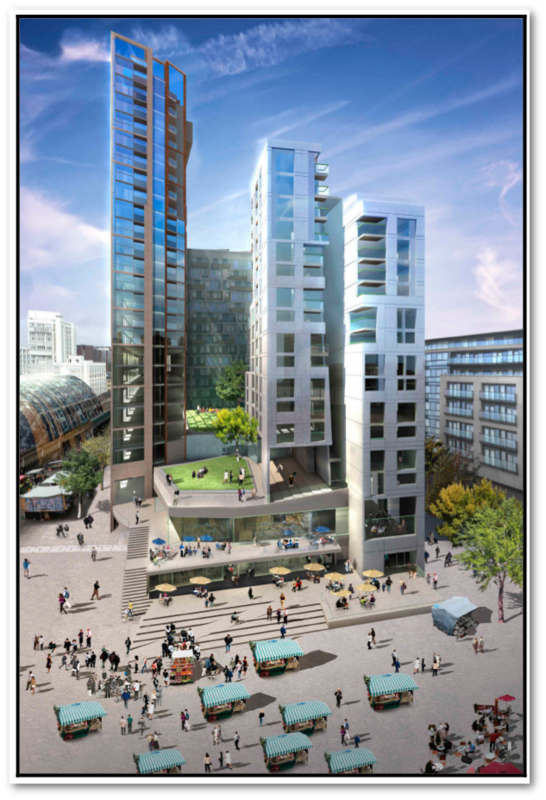 Delancey’s application for the redevelopment of the Elephant & Castle shopping centre includes images of the Market Square, which is part of its neighbouring development Elephant One, also owned and built by Delancey. 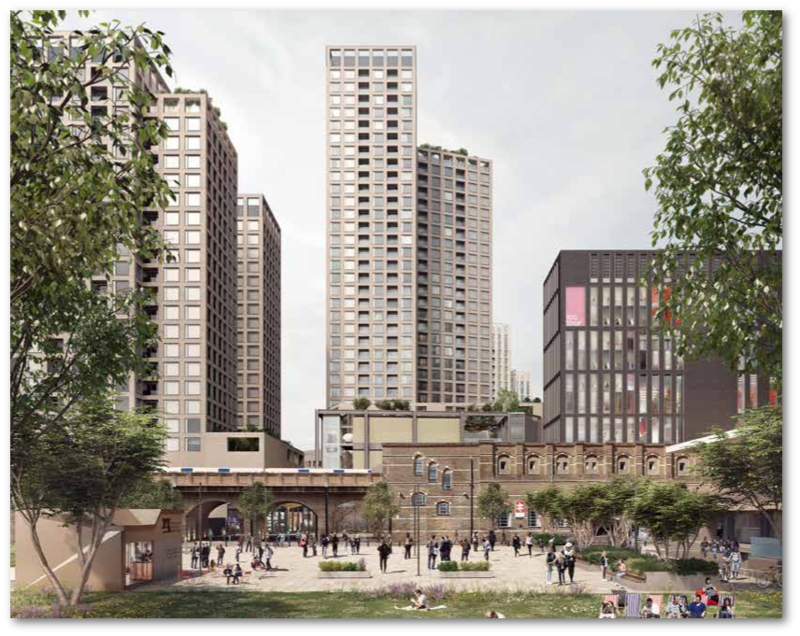 Eagled-eyed campaigners from Southwark Notes noticed that the CGI images of the Market Square omitted the market stalls that had been earmarked for displaced shopping centre traders and asked the question why? Local news website SE1 supplied the answer: it turns out that when Delancey submitted its Market Square ‘Management Strategy’ for approval last June, it changed its use. Southwark could have rejected the management strategy but instead approved it by officer’s decision, without any public consultation. This is the second time that Southwark and Delancey have connived behind the scenes to do local traders down. Delancey dumped half of the affordable retail units in Elephant One back in 2013 and replaced them with a Sainsburys. This latest dirty trick is entirely in keeping with the whole sorry saga of the Elephant One development, whose history shows how Delancey has carved out a great chunk of the Elephant for its own profit at the local community’s expense, aided and abetted by Southwark Council. This is the sorry story of Elephant One so far. Elephant One was the first major development to be granted planning permission at the Elephant, back in 2006. It was originally to be called Oakmayne Plaza, but was subsequently renamed Tribeca Square and then finally named Elephant One after protests from residents and the Council. It is not to be confused with Lendlease’s similarly named and similarly shameful One the Elephant development. Elephant One is a mixed-use development including a cinema, shops, new Market Square, 272 student rooms and 374 private residences for market rent with no affordable housing of any kind. It is not know how much Delancey’s PRS firm Get Living London will charge for market rents, but rooms in Portchester House, its first student accomodation venture, are currently being advertised for upwards of £279 per week (for a room). The development is a joint venture between Isle-of-Man registered, tax dodging developer Oakmayne and Delancey DV4 - a multimillion pound real-estate developer registered in the British Virgin Islands. It has been constructed entirely using an offsite prefabricated construction technique; even the bathrooms are prefabricated in Dubai. The main development site was originally a light industrial estate owned by the GLC until 1987, when it was transferred to Southwark Council. Southwark subsequently sold it to a subsidiary of British Land Plc, which in 2006 sold the site for £8.5m to Eadon Estates Ltd, an anonymous Oakmayne/Delancey shell company registered on the Isle of Man. Having obtained planning permission for the site in December 2006, in March 2007 Eadon Estates Ltd sold the site to Eadon Ltd (another anonymous Oakmayne/Delancey offshore SPV) for £18m. Eadon Ltd then submitted a fresh planning application in 2007. Despite increasing the height of the development by three storeys and overall floorspace by 7,000 sqm, Eadon claimed viabilty poverty due to the large sum (£18m) paid for the site, reducing the affordable housing offer as a result. It was approved on the basis that the developer would provide a number of affordable retail units and a market square for traders displaced from the shopping centre. It would also provide a basement area, which would be used as vehicular service access for the new shopping centre and would also contain a market storage area with lift access to the Market Square above. The basement area would be accessed off New Kent Road. A year later in December 2008, another planning application was approved, further increasing the number of residential units and removing the affordable housing obligation altogether. The planning officer’s report for the application confirmed that the developer had submitted a viability assessment and that the Council accepted that “it is not possible to show that the value from the additional 61 private residential units produces any additional value from which the scheme could support either on site affordable housing or an in lieu payment”. Instead of affordable housing an in-lieu payment was agreed, amounting to just £1m1 and justified by the ‘exceptional cost’ to the developer of providing the market square and the basement access area - estimated to cost £12.5m. (see paragraphs 101-105). Delancey should normally have paid £52.7m under Southwark’s tariff for commuted affordable housing payments2. 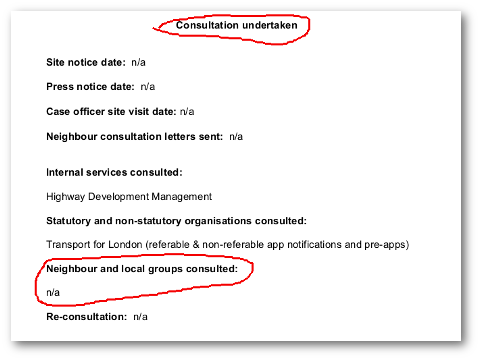 Southwark later accidentally published the confidential viability assessment submitted to justify these concessions. It showed that £18m had been used as the land purchase cost - not the £8m originally paid. It also claimed that the completed residential flats would sell for an average of just £525 per square foot. Flats on Lendlease’s neighbouring Elephant Park are selling for an average of over £1,000 per square foot. In 2011, the site was re-registered to yet another shell company DV4 Eadon Ltd this time registered in the British Virgin Islands. In 2013, Delancey applied for a ‘non-material amendment’ to its planning consent, which included raising the height of the buildings. It also applied to increase the number of student accommodation units from 243 to 272. Both applications were approved as ‘non-material amendments’ by delegated officer decision. 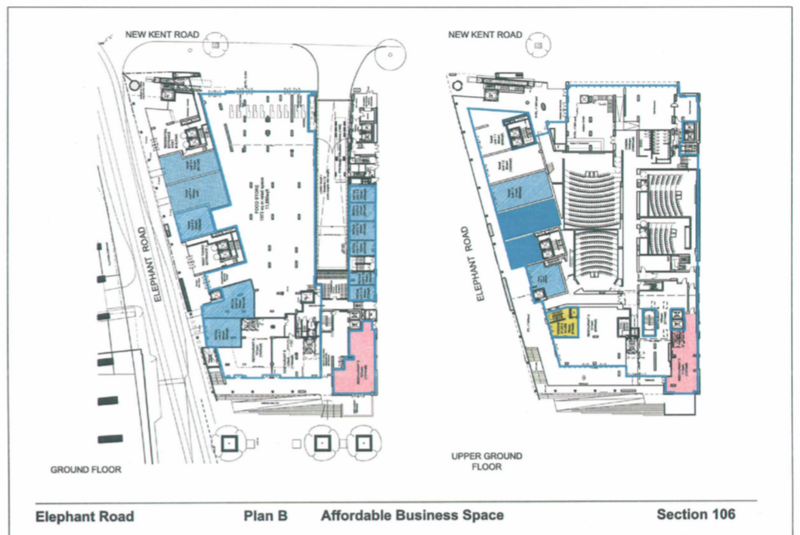 The planning conditions in Delancey’s 2008 final s106 agreement made provision for a number of affordable retail units for traders displaced from the shopping centre at discounted rents3. This was one of its justifications for not providing any affordable housing4. 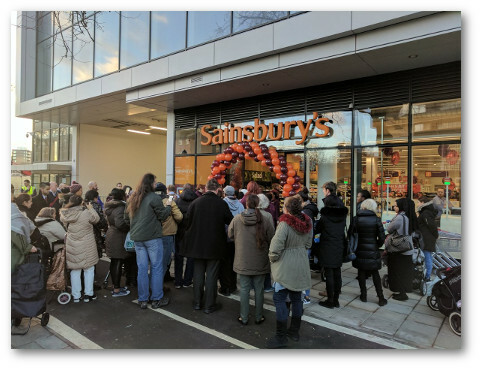 But in July 2013, Delancey went back to the council and applied to have the s106 agreement changed to take these units away from the displaced traders and give them to Sainsburys instead. Southwark duly obliged and the ground floor units earmarked for displaced traders are now a supermarket. 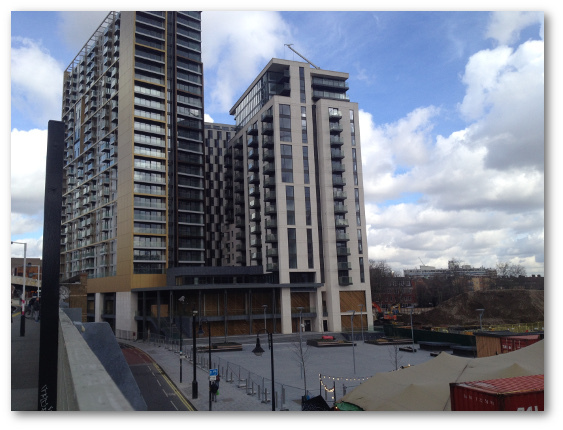 The new Market Square that Delancey was obliged to build is on the site formerly known as Elephant Park and part of the Heygate estate’s green space. It was designated as Metropolitan Open Land (MOL) and used frequently by the local Latin American football league, amongst others. In 2008, Southwark Council closed the Park and sold the land to Delancey on a 99 year lease at a peppercorn rent of £100 per year. The deal was that Southwark would receive 50% of the net revenue from the new market (25% for the first five years). The basement area with its connection to the new shopping centre would be built underneath the Market Square. The lease also included the transfer of a 2m strip of Heygate estate land running along the east of Delancey’s plot and a Council-owned triangle of land on the Elephant Road side. 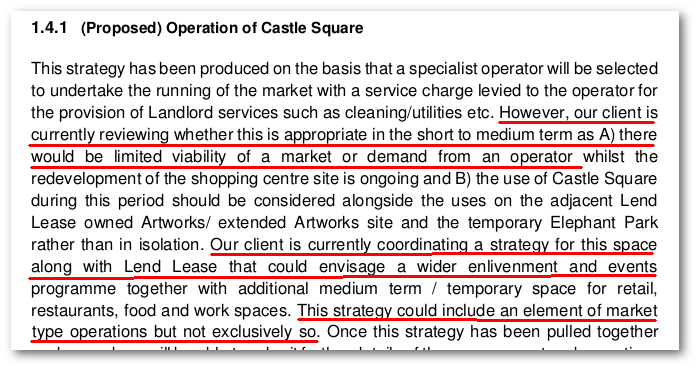 However, in 2016 Delancey submitted a ‘Management Strategy’ to the Council that largely removed the market from the market square (presumably losing Southwark its share of the rent in the process). Delancey claimed there would be “limited viability for a market or demand for an operator” and said that it is currently “coordinating a strategy for this space along with Lend Lease that could envisage a wider enlivenment and events programme”, which “could include an element of market type operations but not exclusively so”. 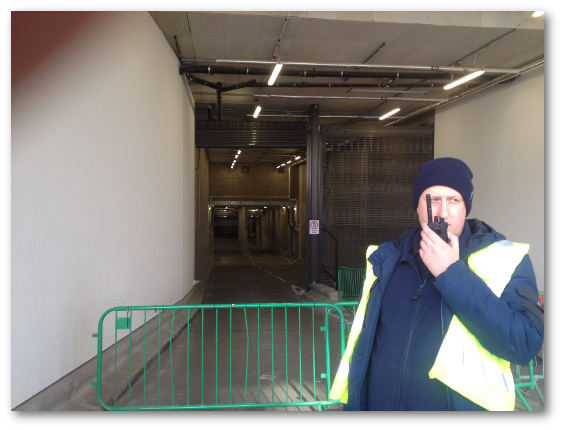 The other obligation that went with the peppercorn lease was the basement servicing area with its access to the new shopping centre, plus storage and access for market traders. 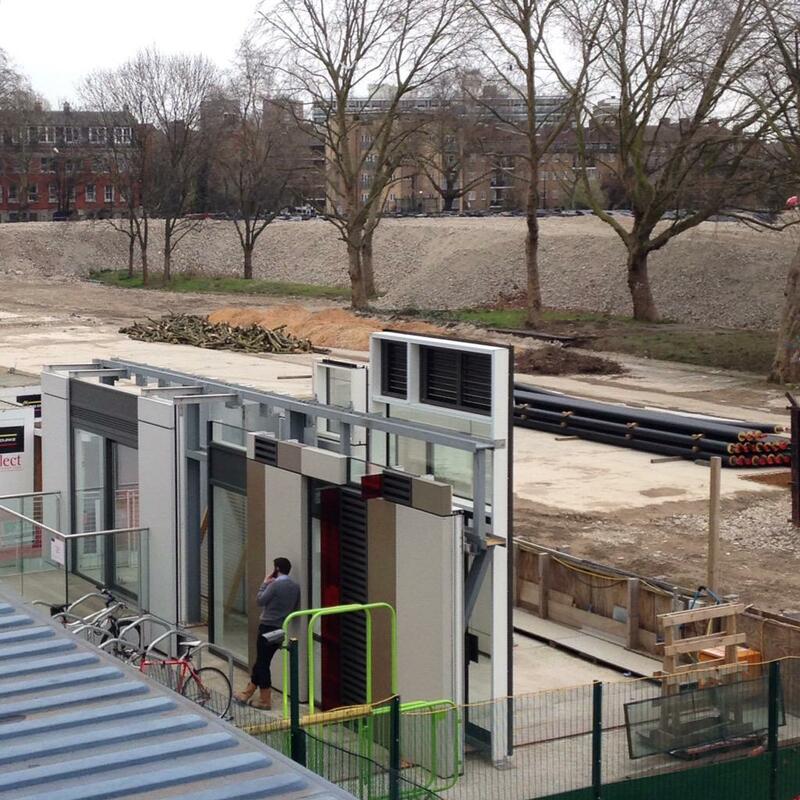 The estimated £12.5m cost of building this, justified not only the removal of affordable housing but it also relieved Delancey of a £6.2m S106 contribution to local transport upgrades, calculated according to Southwark’s Strategic Transport Tariff5. During the course of Elephant One’s development, Delancey itself acquired the shopping centre and in its planning application states that it no longer wants servicing access from the basement under the Market Square. 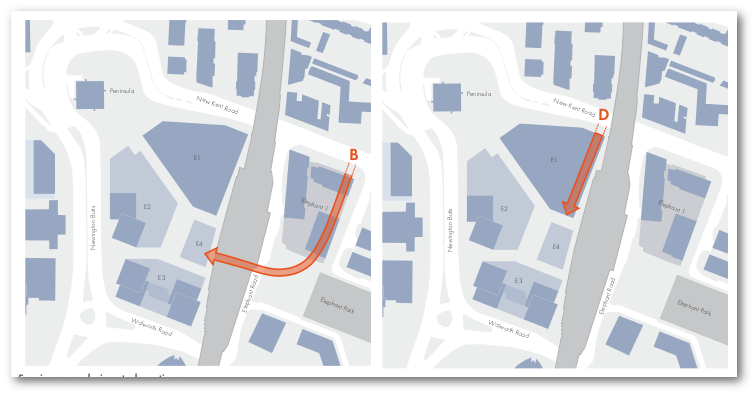 Instead it wants a different access route directly off the New Kent Road. TFL have objected to this change, saying that it will disrupt the flow of traffic and inhibit use of new pedestrian crossings. It also clearly conflicts with the planning permission granted for Elephant One. The basement sits underneath the market square, on council-owned land, given to Delancey on a 99 year peppercorn lease, in order to provide useful infrastructure by servicing a market and giving access to the shopping centre. The market has disappeared and having bought the shopping centre, Delancey says it doesn’t want the access any more. Delancey used the cost of building the basement to relieve itself of affordable housing obligations and the transport tariff, so it has nonetheless clearly served its purpose. If anyone is wondering how Delancey manages to get away with all this, the answer is that Delancey is very well advised. Delancey has employed former deputy Council leader Kim Humphries as its adviser and representative. Indeed, Kim was deputy leader when the planning applications were approved and when the basement/market square lease was signed. He has been for hire as a freelance development consultant since he stepped down as deputy Council leader and Cabinet member for Housing. Kim made his name in the Heygate clearances and is just one of many Council members to have made use of Southwark’s increasingly well-used revolving doors. The development is a joint venture between Isle-of-Man registered, tax dodging developer Oakmayne and Delancey DV4 - a multimillion pound real-estate developer registered in the British Virgin Islands, which has been accussed of ‘aggressive tax avoidance by the HMRC. Delancey is bankrolled by George Soros and managed by Tory donor Jamie Ritblatt, son of property tycoon John Ritblat (British Land Plc). Delancey is also developing the neighbouring shopping centre site and is using a network of offshore SPVs and holding companies to avoid paying tax on its multi-million pound redevelopment of the Elephant. For developing Elephant One, Delancey has used a limited partnership company (LLP) controlled by shell companies registered in the British Virgin Islands and Panama. Filing records at Companies House show that the partnership company hasn’t paid a penny in corporation tax. Delancey also uses a separate company Get Living London to manage its PRS (Private Rented Sector) build-to-rent homes. Despite managing over £1bn worth of PRS homes Get Living London has never paid a penny of corporation tax. The entire Elephant One site including the market square land given to Delancey by the Council, is now registered to a Delancey shell company in the British Virgin Islands. There are lots of things to object in Delancey’s planning application for the shopping centre as we have previously pointed out. We can now add that Delancey and its behaviour is itself objectionable. It avoids taxes and planning obligations; along with Lendlease, it is carving up the whole of the Elephant & Castle with little regard for building anything that doesn’t make it money. Southwark should start showing some backbone and stand firm on its basic planning policy requirements. It should be standing up for the needs of the local community, not making concession after concession to dicey offshore developers. It should use its leverage as regeneration partner and local planning authority to seek a revised Management Strategy and planning application from Delancey, which reinstates the market square and ensures that its shopping centre plans conform with the original masterplan objectives: basement access via Elephant One; affordable retail for existing traders; 35% affordable housing, 50% of which social rent. We have launched a campaign ‘Up the Elephant’ to raise awareness of Delancey’s plans and ensure the shopping centre redevelopment conforms with planning policy requirements. The campaign will next meet on Tues 21 March at the shopping centre - all are welcome (see www.uptheelephant.com for more details).